Batman and Robin. Han Solo and Chewbacca. Shaggy and Scooby- Doo. The quintessential duo has proven that a good adventure is made great with a friend in tow. 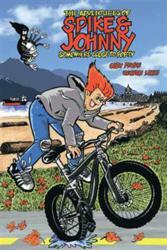 Vancouver author Gary Pryke introduces the next duo to captivate pop culture with his debut young readers book from Trafford Publishing, The Adventures of Spike & Johnny: Somewhere Close to Forty. “The Adventures of Spike & Johnny” is an engaging tale depicting the exploits of 12-year-old Johnny Upanishad and his feisty yet lovable spider accomplice, Spike. Young readers will delight in this quickly-paced adventure, where Spike and Johnny stumble into a new world filled with discovery, danger, mystery and villains, both ominous and comical. Johnny, with his trusty mountain bike and Spike at his side, must follow his hunches and risk everything in the quest to save the life of one fair and innocent girl. “The Adventures of Spike & Johnny” is illustrated by George Louie and is set in Vancouver. This entry was posted on Saturday, April 14th, 2012 at 12:05 pm and is filed under National News, New Releases. You can follow any responses to this entry through the RSS 2.0 feed. You can leave a response, or trackback from your own site.